"Creating solutions for problems that teachers face." In the 5,615, 455 products to help teachers teach students how many of those products are geared toward the well-being of teachers? Very few. However, with the introduction of The Learning Academy that will change. Are you a new(er) teacher looking for answers? Do you struggle on what to do in situations in your classroom? Do you find yourself up at night trying to "solve" the persistent issues in your classroom or teaching career? Are you up at night googling researching and just haphazardly pulling information to try and make things make sense? Are you frustrated with everything in your life? For the past three years, we've been diligent in providing research-based observations from our website, The Educator's Room. However, each day we receive requests for more. So after many focus sessions with our audience, we decided to answer your call with The Educator's Room Learning Academy. What is this learning academy about? 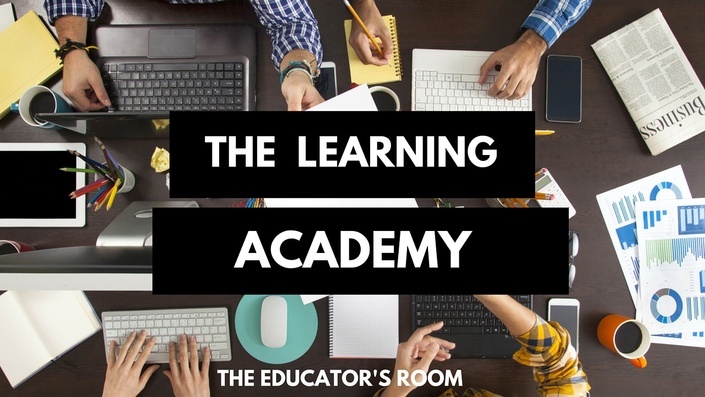 The Educator's Room Learning Academy is a 12-month learning community structured to help give new(er) (i.e. five years or less in the classroom) teachers REAL solutions to REAL problems they face in the classroom. Each month teachers will receive not only quality, peer-reviewed resources, but also strategies to minimize your problems. This one-year program is designed to give you solutions in a structured way so you will not become overwhelmed with so much being given to you at once. Every month will have a focus and based on that focus teachers will have members only videos, podcasts, e-books, PDFs, articles, and other resources. While new content is added monthly, members have the ability to print off what they need to make it through the week. -research-based solutions based on the monthly theme. These solutions will be emailed to all participants on Friday evening in PDF format. -access to printable teaching resources, forms, and templates to save you time for solving your teacher problems. -access to our members-only podcast on Sunday morning for you to access immediately. -access to our members-only videos every two weeks pertaining to the monthly focus. -access to our members-only Facebook group just for you guys. You will have access to all of the TER writers, where you can ask questions and get even more support. -each month a new module is available to members. **Bonus Materials: e-copies of any new e-book released through The Educator's Room. All of this content has the stamp of approval of the teachers who write for The Educator's Room and we've made sure that we've only included what we know to work in our classrooms. Think about your student who starts school in the middle of the week? They're already behind on assignments, expectations and many spend their time the entire semester trying to play "catch up". Registration for this service starts today, but will only last until the 5th of each month. On the 6th of each month, registration will close until the following month. On Friday of every week, teachers will receive an email by 8 PM EST full of resources (e-books, PDFs, Private Podcasts, videos, research, etc.) that fit the theme of the month. These resources cannot be found on the Internet- they are custom made for teachers in The Learning Academy. NOTE: Instead of overwhelming you with 52 weeks of materials and little direction, EACH MONTH A NEW COURSE IS ADDED. That way you have TIME to go through the content. In addition to the resources, all participants will be added to our private Facebook community that will help them as they have questions, need advice or just need the security of support from other fellow teachers. Here's What Teachers are Saying!
" I love that the group of teachers is small and I feel comfortable in asking questions." "Thank you for providing a service that's clear and concrete. I'm impressed that a teacher like me made this and you can tell in the weekly activities I get in my inbox!" Here at The Educator's Room we are a collective of about 30 teachers who average about being in education for at least a decade with more than half averaging at least 20 years in the field. (To read about how we got started click here.) In addition to our time in the classroom, we all have a varied amount of experience in how we have worked in education. Collectivity our teachers on average have 11.8 years of experience teaching in public schools. We have experience not only as teachers but also Instructional Coaches, Department Chairpersons, Literacy Coaches, Administrators and more. So how can I get this service? Now with all of the work that we've put into this service, it's important for us to ACTUALLY PAY our teachers for their time providing this service. So we wanted to make sure this service is affordable for ANY budget, you have several options to pay: $9.99 per month, $25.99 every quarter, or $99.99 yearly. So that's literally as much as you would pay for your daily cup of coffee. The best thing about this service is that you can cancel at ANY TIME. No questions will be asked- we detest contracts. If you're ready to try this service click above and lets start by clicking the link below. For fifteen years, I taught high school English/Language Arts in inner city children in both Memphis and Atlanta. During my time in the classroom, I managed to accumulate numerous teaching awards and always felt like my purpose in life was to work with the kids that many people forget-inner city children. In 2012 right after being voted Teacher of the Year, I was told that my district was going through a reduction in force and that I would have to reapply for my job. The day after I interviewed for my position, I started The Educator's Room to release some of the anger I felt around the profession. This blog has breathed new life into my professional life and has allowed me to pursue some opportunities outside of the classroom. Right now I work as a Literacy Coach in the metro Atlanta area and I love my job. I can remember being in the classroom constantly thinking that we (teachers) are the real experts in education. I worked with so many people who possessed so much knowledge of their craft that I was amazed that they struggled for respect-whether it was in the form of their compensation or just their opinion on issues in education. When I started this blog, I told everyone about my idea, but many people didn’t believe that anyone would ever listen to just some “teachers”. Armed with my beliefs, I was able to recruit some fellow educators from across the country to write about all topics in education. Four years later, we have over 30 teachers on staff writing about their expertise in the classroom. The course starts now and never ends! It is a completely self-paced online course - you decide when you start and when you finish. Each month we add a new content to make sure that you don't feel overwhelmed. - Access to the modules with a new content being added every month. - A community ready to help you tackle any issue you are having. - Learning that transcends any resources found in a building. This is a great choice if you're looking for a low-cost option! This option includes a copy of our free book, Keep the Fire Burning: Avoiding Teacher Burnout.